While the industrial sector in Europe was previously strongly based on mass production technology, it is now moving towards highly customised products and thus to lot-size-one production. The change in production paradigm is strengthened by the emerging technologies. In small- and medium-sized enterprises (SMEs), this means, for example, the increased use of modern digital manufacturing tools, new additive manufacturing processes and novel engineering intelligence solutions. As a direct result, workers need to develop new skills and competences to effective work. From an educational perspective, it is especially critical that people with few prior successful experiences with fully applying the key information-processing skills need to obtain adequate comprehension to guide them in structural changes in their future working lives. 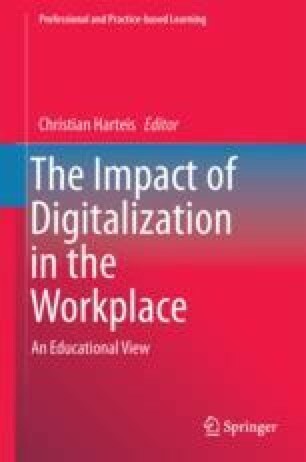 In this chapter, we will discuss the critical points of adults’ skills based on the PIAAC large-scale assessment results and illustrate novel educational approaches to meet the emerging needs on the digitalisation of work. Based on these critical points, we will illuminate two learning approaches that can guide educational efforts in designing ‘future’ learning at manufacturing sector. Our first approach is a pedagogical evidence-based physical and virtual learning environment that is based on learning in a reality-conform production environment. In our second approach, we will illustrate a simulation-based learning environment that is designed to increase the understanding of complex machine systems. ACEA – European Automobile Manufacturers’ Association. Acea.be. (2015). [Online]. Available: http://www.acea.be/statistics/tag/category/employment-trends. Accessed 28 Nov 2016. Manufacturing statistics – NACE Rev. 2. Ec.europa.eu. (2016). [Online]. Available: http://ec.europa.eu/eurostat/statistics-explained/index.php/Manufacturing_statistics_-_NACE_Rev._2#Further_Eurostat_information. Accessed 28 Nov 2016.